Alistair Brown – Lee from Great Britain, who is currently ranked number one in the world, came first in the Men’s elite race to claim the European Championship title, crossing the finish line in 1hr 44 minutes and 23 seconds, comfortably beating Spain’s Javier Gomez who clocked a time of 1hr 45 minutes and 3 seconds. 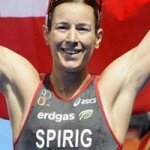 The two athletes were shoulder to shoulder for a large portion of the race, particularly tailing each other during the swim and cycle. 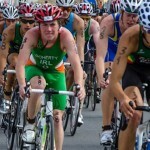 Ireland’s Bryan Keane took his place among the best triathletes in Europe and finished in a time of 1hr 48 minutes and 49 seconds. He seemed disappointed with his performance, speaking after he crossed the finish line he said ‘I guess you could say I had a bad day at the office, I wasn’t happy with my swim but that’s racing for you, good days and bad days’. Third place went to David Hauss from France who finished in a time of 1hr 45 minutes and 30 seconds following a neck and neck final lap between himself and Gomez. The elite race began at 4pm following short delay as the course was subjected to some last minute changes for safety reasons. 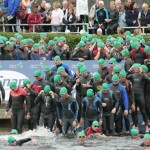 The race began with an impressive dive from the 62 athletes leading into the 1.5km swim loop in the River Shannon before the competitors took to their bikes for 8 laps totalling the 40km bike challenge, and ended with a spectacular town-centred 4-lap 10km run as the crowds looked on. Javier Gomez and Alistair Brown Lee asserted their standing early on coming out of the swim in 2nd and 4th position respectively. It was a battle of the brothers as Jonny Brown Lee tailed his elder sibling during the swim, holding onto forth as Alistair moved into 1st leading up to the run, before slipping behind during the second last lap as Alistair stretched his lead to 51 seconds ahead of Gomez. Thousands of supporters lined the medieval streets cheering on the athletes from 20 countries competing in the event which is the largest championships ever staged in Ireland, second only to the Special Olympics. The junior men’s race took place earlier in the afternoon and first place was claimed by Spain’s Vicente Hernandez, second was Andrey Brukhankov from and third was Vyacheslav Pimenov, both from Russia.